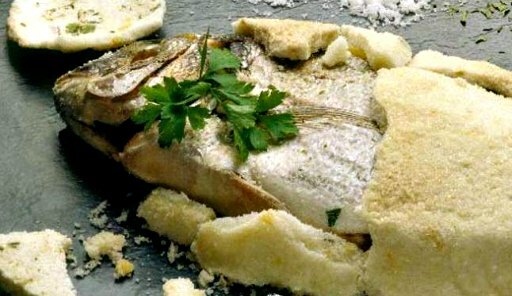 Dorada - or gilt-head bream- is usually prepared by baking it in a salt crust. Most Spanish food experts believe the method originated in Murcia, but it is now common practice in Andalusia as well. Don't be put off by the large amount of salt. It seals in the juices of the fish, resulting in a succulent dish that delivers pure fish flavour without a trace of saltiness. Ask your fishmonger to clean the viscera from the fish without cutting the belly open, which can usually be done by pulling them through the gills. Also, make sure the fish is not scaled. During baking, the salt forms a hard crust that adheres to the scales, so that when you break the crust before serving the fish, the skin stays attached to the crust, peeling away easily to expose the juicy, succulent flesh underneath. The salt must be coarse, too - fine salt just won't work. Some cooks like to sparkle the salt with water. I skip this step because I have found that the water prevents the crust from getting nice and hard. Other fish, such as snapper, sea bass, and turbot can also be baked in salt with good results. Fiure on 15 minutes per pound for baking. Serve the fish with boiled potatoes. Preheat the oven at 450ºF. Select a baking pan only slightly larger than the fish and cover the bottom of the pan with a layer of salt 1 1/2 inches deep. Place the fish on top of the salt and cover completely with the rest of the salt. With your fingers, press the salt against the fish to ensure that is completely enclosed. Bake the fish for 1 hour. Remove it from the oven and let rest for 5 minutes. With a chef's knife, crack the salt crust open lengthwise along the centre of the fish. First lift one half of the crust in one iece, then the other. The skin should be attached to the crust. Gently remove any skin remaining on the fish. Using a spatula, lift the top fillet of the fish and divide it between 2 warm plates. Remove the central bone and discard it. Carefully lift the bottom fillet and divide between 2 additional warm plates. Serve the fish immediately with the boiled potatoes. 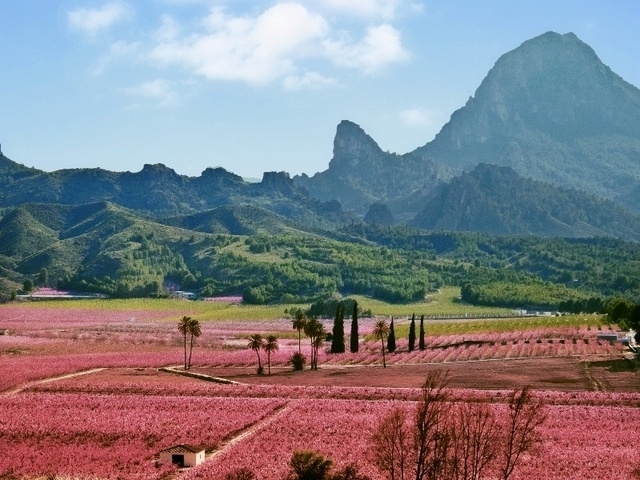 Murcia serves authentic Mediterranean cooking: cereals, vegetables and olive oil are the base of this cuisine, which finds its source of inspiration in the market garden - natural, authentic, tasty and with a character all of its own. Spanish Seafood recipes: The long coastline of Spain, combined with the two archipelagos, the Balearics and the Canaries, ensures that fresh fish and shellfish are ubiquitous elements of the Spanish table.